It’s Halloween this friday, so I thought what better colour to feature than orange? Often picked as the colour for autumn (or fall), orange is a colour that can easily be worked into homes anytime of the year. Paired with navy blue for a bold summer look, soft greys or pale greens in winter or clear blues and soft pinks in the spring time, orange is bright, beautiful and very versatile. This week’s material focus is fabric versus leather, for sofas, dining chairs, barstools and beyond. Our match up today is more to do with personal preference than one material being significantly better than the other. In the furniture world, salesmen, manufacturers, designers and consumers can all argue their preference for endless amounts of time. In my opinion? I think when it comes to sitting and relaxing, its always best to go with what looks best, is most comfortable and will provide the best value for money for you. However, in order to make that decision, it is always wise to know some important facts about what you are choosing. Leather: Comes in all different grades, thickness, ages and process types. The most confusing part is that there isn’t really an industry wide standard from one category to the next. Some stores will use Category A – Z, while others use more a numerical system. Vat dyed leather is the absolute most important feature to look for – it means the dye colour goes all the way through the hide. This means that scratches will be far less noticeable (especially if you’re going for that ruby red three seater). Thicker hides will provide a firmer seat, whereas soft or antique hides have a bit more give in them to provide a softer experience and aesthetic. Leather can scratch, and it will most definitely age and need routine cleaning and moisturising to maintain it’s appeal (about every three months). The bottom line is: leather is a more expensive option, it can last longer and is a great option for children and pets – but that all depends on how it is cared for. Fabric: Similar to leather, there are so many options when it comes to fabric choices, from cords, suedes, linens, knits, velvets or woven patterns – the options are endless, as are the colour choices. Fabric can be a favoured option because unlike leather, it breathes. Where many people don’t like sitting on a cold couch in winter or sweating it out on leather during the summer, fabric can be an excellent choice. Depending on your selection, most fabrics will also be significantly lower in price than leather options – meaning the investment doesn’t need to be quite so long term. Are you concerned about pets? Suede, Cord or tightly woven fabrics are a great choice. I personally prefer fabric, and with a cat and two fabric sofas so far we have not had any problems. An initial fabric protection (or scotch guarding) and regular vacuuming are the only maintenance required – but it’s also a great idea to get fabric furniture steam cleaned at the same time as carpet or rugs. A Herringbone wall tutorial, divine poached pears and a home to set my heart on. This week has well and truly got me inspired and ready for the weekend ahead. From making, to creating and enjoying some time out – I am really looking forward to it. I hope these images inspire you as much as they have inspired me! The wall that started it all – Without a doubt, this wall turned my week around! I’m such a lover of chevron, but this herringbone pattern takes it one step further and is like a breath of fresh air. Poach Pears – In Sydney we are currently enjoying the best pear season yet (perhaps because this is the first season I’ve really discovered them) and this desert looks both incredibly yummy and on the healthy side too (and don’t we all love that!). Pair with some Vanilla Bean yoghurt and take a mini trip to heaven! This home – No really, THIS HOME! The past few weeks I have been spending quite a bit of time walking around our neighbourhood getting inspired by the local architecture. My ultimate dream is to build our own home from scratch and even though I stumbled upon this place while researching online, I think it is a great piece of inspiration! Uashmama – Believe it or not, even though these gorgeous bags look like leather they are actually made from reusable AND washable paper. Hand made in Tuscany these bags are the bees knees – stylish and ready to use for almost anything that fits! Reading Nook – What would a weekend be without a little rest and relaxation? This nook, in all its modern, simple and refined elegance fits that bill perfectly! When can I check in? 1. Simplicity and Minimalism – This means not over doing or over thinking it. Scandinavian design is very simple and minimalist in its form, colour and texture. Take at look at most examples and you’ll find some key attributes such as a strong use of a white, grey and neutral colour palette, raw timbers and simple shapes. 2. Functionality – Keep the function of your room in mind and work in furniture or pieces that are suited to that specific space. 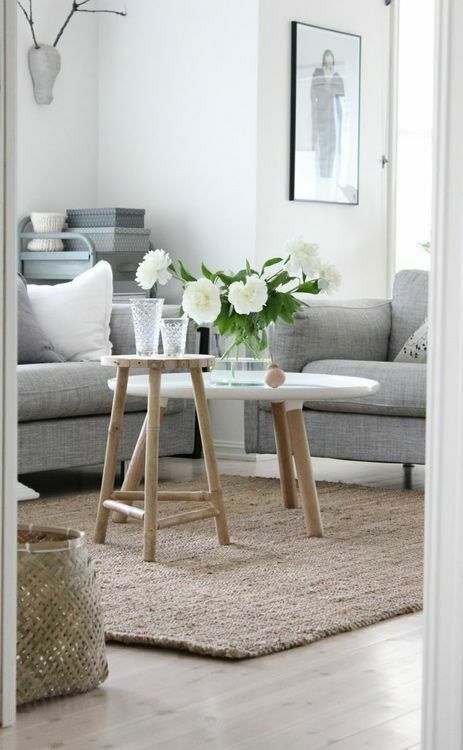 As Scandinavian styling is very minimalist, ensure what you are adding into your room is simple in its form. The more you look into the style, the more you will see some key attributes with Scandi style, such as fine lines and crisp angles. It’s not about spending a fortune (we all know Ikea is one of the biggest retailers of this style) but more so about carefully choosing your items. 3. Fine Lines and off the floor– Most Scandinavian furniture is often made from materials that can be formed in very slender shapes – Scandinavian tables, chairs (and even sofas) often have slim arms and/or legs. It is one of the definitive features of this style and it’s a huge bonus if you don’t have a lot of space. The slender lines and style of this furniture – that is, lifted off the floor – helps to make smaller spaces appear bigger. Pair this with light colours and natural materials and that tiny apartment begins to look a lot more spacious and well thought out. This weeks colour is a challenge for me. I say that straight up, as it is not one I would really choose for my home. In saying that, I chose this colour because often as a designer we have to work with styles or colours that are very different to our own personal choices. It is always a bigger challenge than working with what you love, but it’s a very important skill to master and reaps huge rewards when the client loves what has been created. So, with that in mind, I put myself to the challenge and this week our colour is Lime. Take a look at the images below to see how this bright, vibrant hue can effectively be worked into a variety of styles – and for some tips on how you can work it into your home (if you’re like my Mum and LOVE the colour). Work it with Neutrals – Lime goes so well with neutrals like tans or warm greys as it’s such a vibrant colour that is often found in nature. By using a variation of Lime that is toned back to it’s most natural state, the colour enhances neutral palettes in the best way possible – giving neutral rooms a cheeky grin! Background Drama – Adding lime to your background – be it in bookcases or on a splash back – adds a punch of colour to a room like nothing else. The key here is to pair in with crisp whites to achieve a fresh & vibrant scheme where the lime can do all the talking. Tie it together – Like any colour scheme, when it’s tied together in the details, it works 100% better. The below bedroom colour palette works because all the colours used are clean and crisp, they have similar levels of clarity and by sticking to the colour palette in the quilt cover the overall scheme is cohesive and well executed. Variety – Using a variety of greens and various shades of lime, the two rooms below work exceptionally well to create welcoming, sophisticated looks. Both garden inspired rooms take this particular shade of green to a new level by incorporating fresh greenery, art and a natural base.